This building, said to be Wales’ oldest snack bar, was originally a parcels depot for Cardiff Corporation Tramways. It was close to the tramway offices in the fish market. The system of 130 trams and 32 miles of track was used to distribute parcels from 1911 until the Second World War. The photo on the right (courtesy of Cardiff Libraries) shows trams in The Hayes c.1948. There was one track per direction and a loop line, for recessing or turning back trams, in the middle distance. After the war, the depot building became a snack bar. The snack bar’s owners took charge of the nearby Victorian underground toilets in 2014. The Hayes (“Yr Aes” in Welsh) means “The enclosures”. The same element is in Cathays. Here it probably referred to enclosed gardens at the south end of Working Street, within the old town walls. The name applied in the early 19th century to a small area of housing around what’s now The Hayes and Hayes Island. By 1849, it referred specifically to the street between Working Street and the former Waterloo Bridge over the Glamorganshire Canal (now culverted), where Caroline Street, Bridge Street, Mill Lane and Hayes Bridge Road now meet. Hayes Island probably takes its name from a triangular “island” once bounded by Victoria Place, Working Street and the former end of Wharton Street (on the north). This triangle was occupied by a small open-air market and houses fronting Victoria Place and Working Street, but changed after the opening of the library (now the Cardiff Story Museum) in 1882. 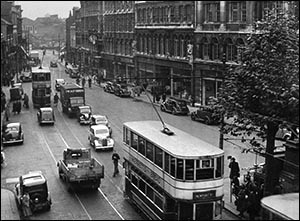 The “island” was a safe haven from the road traffic which surrounded it and the trams that ran along Working Street and The Hayes. 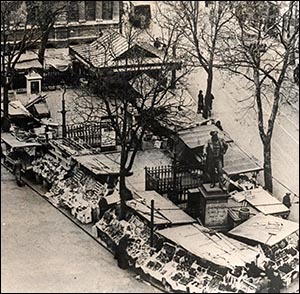 The photo of the market on the left (courtesy of Cardiff Libraries) was taken in 1946, showing the snack bar building near the top and the statue of John Batchelor. Hayes Island wasn’t always as peaceful as it is today! The noises of the market and trams were occasionally supplemented by the impassioned speeches of workers’ leaders in the early years of trade unionism, when The Hayes was a gathering place for meetings of dockers and other workers. Another source of noise was a former solicitor called William Medway Davies, who became known as the “Hayes Orator”. He could be “found every night haranguing the crowd on The Hayes upon deeply philosophical subjects”, when not chalking his grievances on the pavements. Eventually, in 1899, he broke the rules for public speaking in London’s Hyde Park. Despite arguing that he was “certified as being non compos mentis”, he was ordered to pay 40 shillings or spend 21 days in jail.